A reproduction of the common valve removal tool (often called a pickle bar) that aids in installing the valve assemblies in all the 85-100hp flathead V8 motors. Slip the forked end between the valve spring coils to catch the groove in the valve guide. Leverage the bar to pull the guide down in order to install the valve guide retaining clip. 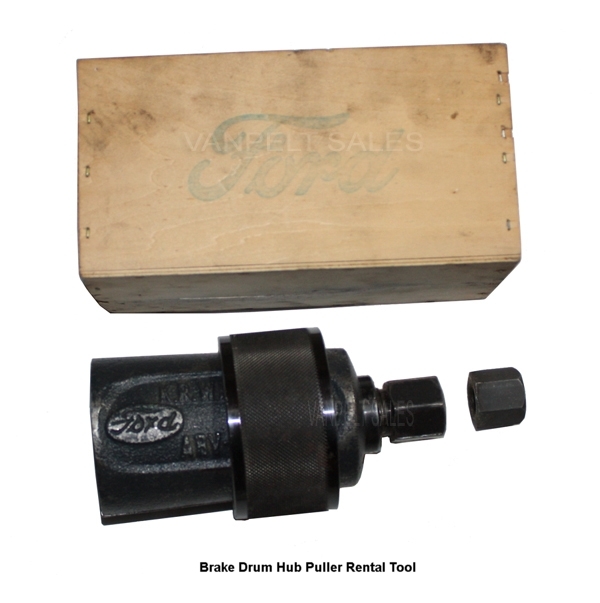 A handy tool to securely hold the early Ford type 3 speed transmissions for bench-top repairs. Made of heavy gauge steel. Attach the front of the gearbox case to the stand with two bolts, nuts, and washers (hardware not included). 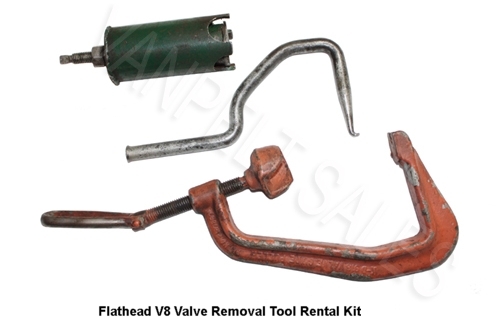 Valve Tool Kit is available for rental only. Includes 917, the 918, and a 2364 tool. By combining the use of these and common automotive tools, you can remove stubborn flathead V8 valves, valve guides, springs, keepers......in other words, the entire assembly. Available for a 2 week rental ($50.00) or 1 month rental ($75.00) plus the cost of UPS to and from our warehouse. USA customer locations only. Requires a $200.00 credit card deposit. We supply the UPS return label for easy drop off at your local UPS Store. Call to schedule. Our VGBT pickle bar tool, a helpful part of the removal process, is not available for rental, but can be purchased outright (see VGBT above). This is the Winfield Tool Works hub puller for rental only. Safely removes stubborn drum hubs. Available for 2 week ($25.00) or 1 month ($40.00) rental plus the UPS to and from our warehouse. Requires a $200.00 deposit on credit card. USA customer locations only. We supply the UPS return label for easy drop off at your local UPS Store for return. Call to schedule. * Please Note: All international packages require completion of the Customs Declaration Form, and will be charged a $10.00 documentation fee.